Julia Gillard is the Australian prime minister who finally ran out of tolerance and delivered an amazing 15 minute speech on the sexism and misoygny of the Australian opposition leader. If you ever encounter anyone who says women can’t cope with the rough and tumble of politics show them this. I know little about her and her politics but think she is magnificent in this speech, a real role model. “Let’s go through the Opposition Leader’s repulsive double standards, repulsive double standards when it comes to misogyny and sexism. We are now supposed to take seriously that the Leader of the Opposition is offended by Mr Slipper’s text messages, when this is the Leader of the Opposition who has said, and this was when he was a minister under the last government – not when he was a student, not when he was in high school – when he was a minister under the last government. 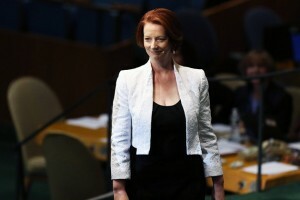 Julia Gillard I salute you.